January, 5, 1998. Celebrating the 5th issue of "Never Before". 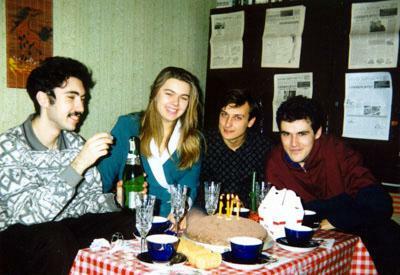 From left to right - I.Krishtal, I.Basistaya, S.Krysanov, K.Demchenko. It's a real student's newspaper, as everything, including editing, printing on a computer, making the layout and supervising the process of publishing is done by the students themselves. "Never Before" covers different students news and news from English lessons. It has a regular column "Ours in the States", where the articles of the students who visited the USA as exchange students or on some other programs are published. There is a regular musical column, as well as some language contests for readers (finding mistakes, explaining the meaning of idioms). Special issues were devoted to the results of the city-wide contests of compositions in English "An Educated Person is..." and "Facing the Millenium", "English in the New Millennium" held by Voronezh Association of English Language Teachers. 13 issues of "Never Before" have been published so far.